Enjoy dowsing ley lines and water lines at ancient sites in the Burren. The Burren is a limestone region and geological wonder on the Wild Atlantic Way. The Burren holds exquisite earth energies of very high frequencies, and the fairy realms love it! Try your hand at dowsing (or divining as they call it in Ireland). Dowsing is an activity where you lose your sense of time, since it requires you to focus on the present moment. Many people have enjoyed dowsing ley lines and water with Jackie on her tours began in 1999. Moreover she is a local author of many books. She is an experienced dowser and a very experienced guide who lives in the Burren. Or you can explore water lines at holy wells in the Burren with Jackie Queally. For coach parties this tour is restricted to Kilmacduagh Monastic complex that is rich in ley lines and history. Learn about the secret energies of Irish round towers when you visit the tallest Irish round tower at Kilmaduagh. Hear legends of early princesses and monks who lived in the region. Visit holy wells and try your hand at detecting underground water. 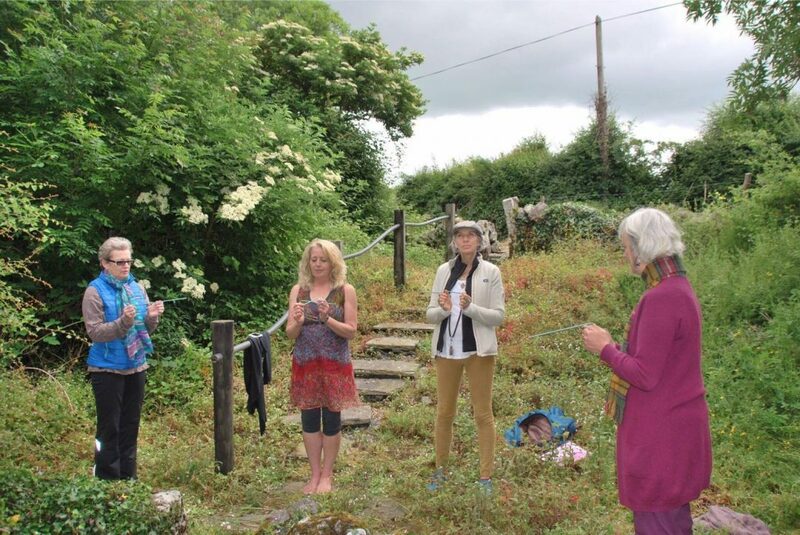 Visit an ancient dolmen and fairy fort to explore the pattern of earth energies there, introducing sound/toning as another dimension to see what happens when dowsing with rods and pendulums. These day tours are slow tours within a short area of driving to give you a sense of dipping into a region that is deep with mystery and wonder. WB Yeats lived nearby for 12 years inspired by the beauty and power of nature here to write his best poetry. Jackie is a unique tour guide with nearly 20 years experience in guiding. Her book Spirit of the Burren is a useful read for this tour, and includes information on round towers and earth grids. Jackie is also an international biofield tuner and finds this experience continues to assist her awareness of earth energies.